Trevor Bayne made his return to the driver’s seat behind the wheel of the No. 6 Roush Fenway Racing Ford at Sonoma (Calif.) Raceway on Sunday for the Toyota/Save Mart 350. It was his first turn in the car since Matt Kenseth, officially, began his stint as co-driver of the car. Sixteen races into the 2018 Monster Energy NASCAR Cup Series season, Bayne has been in the car for 12 races and Kenseth the other four points-paying events, five races, total, if you count the Monster Energy All-Star Race. What have we learned, if anything? More importantly, what has Roush Fenway Racing learned that can be used to make the struggling organization better? Personally, I’m thinking one lesson may be that Bayne isn’t as bad a driver as some seem to have thought. You know, those fans who seemed to think Kenseth was going to be some shot in the arm, of sorts, and with his rejoining RFR, he was going to automatically return the once glorious team to victory lane on a regular basis. Hasn’t happened, has it? And that’s by no means a dig at Kenseth, far from it. But has Roush Fenway accomplished anything by making Bayne share with his new, proverbial, big brother? Doesn’t look like it. 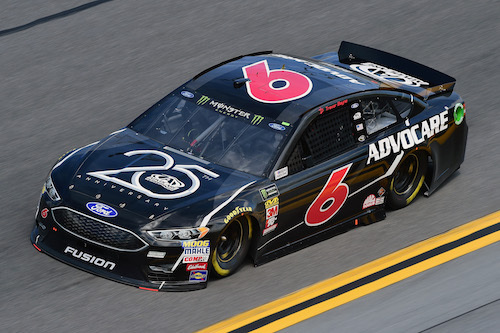 In 12 races, Bayne has an average 2018 race finish of 24.9. That’s pretty darn close to Kenseth’s average finish of 24.8 in his points-paying races. There’s a slight difference there, but it’s negligible. Then, there’s driver input. When announcing Kenseth’s hiring, team owner Jack Roush, expressed a desire for input from the former champion that would help RFR right the ship. According to Bayne, though, Kenseth has echoed his input. Doesn’t sound like RFR is getting additional input, just a repeat of what it has already heard from Bayne. Maybe something has been learned, here. Maybe the lesson to Roush Fenway Racing is that, maybe, Bayne knows what he’s talking about. Maybe the problem with the team is something that even a championship-caliber driver, like Kenseth, has no answer for. And, maybe, Bayne is more talented than he’s given credit for. Things may turn around when Kenseth gets back in the car in a few weeks. After all, he’ll have a few 2018 races under his belt already. But, then again, he’ll probably have some rust to knock off after another, but shorter, stint out of the car. I’m beginning to think the only thing this ride-sharing thing has accomplished is giving Bayne more confidence — confidence that he’s not the problem, after all. The former champion that was supposed to come in and right this ship can’t seem to drive that ship any better than he can.